This level has hard difficulty. 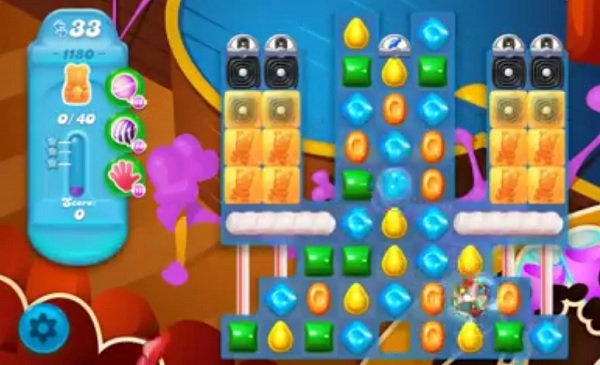 For this level try to play from bottom part of the board where more candies are available to play and make special candy. Try to use striped candy with other special candy to break the honey blockers to save the bears. This level is ridiculously difficult. Really think you need to fix it. At the least, add more than 35 tries!! Please!!! This was a Hard Level with 43 Moves and those guys Subtract 10 Moves? Such Crap!! This level is so stupid there is not enough move or its to long. so they are making harder so you have to pay money to pass this level ?.there is no way you can pass this with the move they give you. This level is so stupid there is not enough move or its to long. so they are making harder so you have to pay money to pass this level ?watch the video they can’t pass it without using the added help so you have to pay money to get all that.there is no way you can pass this with the move they give you. Absolutely agree with the comments above. There is no way I’m ever going to get through this level – I’ve been trying for ages – I don’t have the boosters to help me & I don’t know how you could accrue so many lol. There is a video on you tube that does it without any help though so I’ll keep trying. I hate this level. My anxiety has increased greatly because of it. I thought this game was designed to relax you? I’m board and might quit playing this game because it’s too hard. You should be ashamed for making it too hard where you destroy every booster you use before you get to the last bears.